Council leaders held the first of a new kind of meeting dedicated to questions from the public and broadcast live on the internet on Monday. Boston Borough Council’s Ask The Cabinet session focused purely on the questions from the public with no official agenda items. Although members of the public can already ask questions at the beginnings of committees, cabinet meetings and council meetings, council leader Coun Peter Bedford said he wanted this type of session to be more informal. He said the evening itself ‘was very good’ and that he was ‘pleased with the turnout’ but said they would have liked more to have gone along. 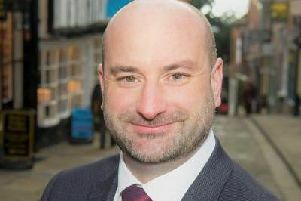 Although some questions were more likely to be dealt with by other authorities such as police or Lincolnshire County Council, Coun Bedford said his cabinet would be showing their support by taking questions they could not answer to the relevant people. More than 10 questions were put to the cabinet on Monday evening. They ranged in topic from the provision of public toilets, the clearing of litter and cutting back of ‘dangerous bushes’, whether the Quadrant development would affect town businesses, the placement of bins following collections, and safety concerns relating to council vehicles driving through Strait Bargate. The next Ask The Cabinet session is planned for Monday, January 25, 2016.